The PCE-JS 100 pocket scale is an accurate device with a high resolution and a good protection due to its cover. It is an ideal scale for laboratory use or any other purpose where highly accurate readings and mobility are required. The PCE-JS 100 pocket scale has a stainless steel weighing pan to ensure a long working life. The pocket scale is very easy to operate with only four keys located in the backlit LCD display. The PCE-JS 100 has different measuring units such as g, oz, ct, gn and the piece counting function which turns the scale into a very flexible device. The calibration functions allow to easily calibrate the scale by means of an optional calibration weight. An ISO calibration certificate can be also obtained separately (optional). Here is another type of pocket scale that might suit your needs. At the following link you will find an overview of all the scales and balances available in the offer of PCE Instruments. 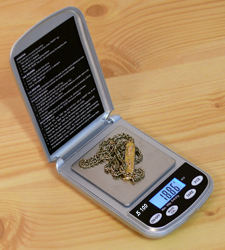 The ISO calibration certificate documents the properties of the pocket scale. 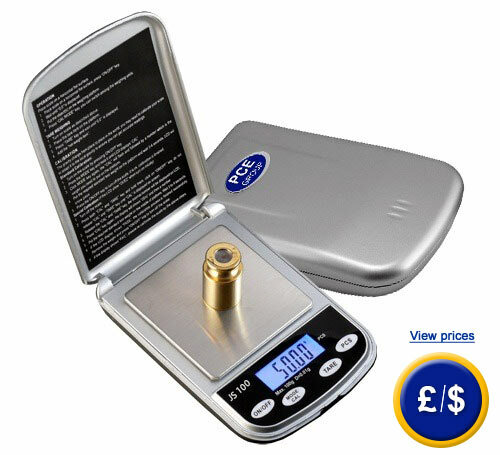 It ensures that the pocket scale meets the national standards. 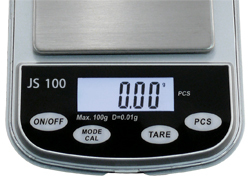 The accuracy of the pocket scale can be checked by means of the control weights . It is also possible to calibrate the scale with a calibration weight of 100 g.